Led Zeppelin's earliest known live recordings have surfaced on YouTube for the first time. 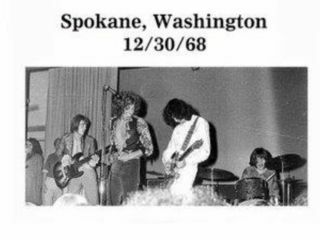 The three audio clips, recorded during the band's maiden voyage to America, are taken from their fifth US show, which took place at Gonzaga University in Spokane, Washington on 30 December, 1968. They were opening for groups like Iron Butterfly, Vanilla Fudge and Country Joe And The Fish at the time, and Led Zeppelin, their eponymous debut album, was still weeks away from release when they embarked on a rather ambitious 34-show run that took them from Denver, Colorado to North Miami Beach, Florida. US rock fans were familiar, to some degree, with Jimmy Page from his work with John Mayall And The Bluesbreakers and The Yardbirds, but it's interesting - and downright quaint even - to hear Robert Plant announce the name of the brand-new band to the barely receptive audience. Check out the YouTube audio of two Led Zeppelin cuts. The first is Dazed And Confused. To complete silence, Robert Plant introduces the song, which features a spine-tingling middle section of Jimmy Page's violin-bowed guitar playing and a rousing group climax. You want dynamics? You've got 'em! Next up is How Many More Times, Pts 1 and 2.The last song in Zeppelin's set, and by now they've won over the audience. Plant introduces each band member by name - Page is identified somewhat Spinal Tapishly as playing "lead guitar" and elicits the biggest response from the crowd. And the group puts out: Plant's siren-like voice is full of youthful vigor; John Bonham's drumming is a fascinating mix of nuance (especially in Pt 2) and locomotive force; John Paul Jones is the musical glue, as always; and Page mesmerizes. His leads are searing, his call-and-response lines with Plant are growling and playful, and his use of a violin bow on a Telecaster is haunting.